Wakeboarding vs kitesurfing: What's The Difference? If you’re considering getting into a board sport, you may wonder how wakeboarding compares to kitesurfing. It’s a very good question since these two sports have a lot of similarities and use very similar types of boards. There are also obvious differences, such as the fact that wakeboarding involves engine-powered traction whereas kitesurfing uses the power of wind. How does wakeboarding compare to kitesurfing in terms of riding experience, learning curve, equipment and cost? Do skills carry over from one sport to the other? Wakeboarding and kitesurfing involve similar traction-based board riding skills. However, wakeboarding involves greater speeds than kitesurfing, while kitesurfing requires additional kite flying skills. Wakeboarding is generally more physically demanding than regular kitesurfing. Wakeboarding offers a more controlled environment than kitesurfing, so practicing wakeboarding typically helps to learn kitesurfing faster. Wakeboarding costs more than kitesurfing because of boat expenses. In this post, we take an in-depth look at how both sports compare and how practicing one can help you get better at the other. The main difference between wakeboarding and kitesurfing is that in wakeboard, speed comes through horizontal traction in the rope from the boat or in the cable, whereas in kitesurfing, the traction from the kite is normally much more vertical – though the angle of the lines will vary depending on where your kite is positioned. Another key difference is that, in wakeboarding, all the force from the pull goes into your arms and upper body through the handle you hold, whereas in kitesurfing, most of the force goes through the harness into your hips and core – there is basically no pull in the kite control bar. In wakeboarding, you use your arms as if kiting unhooked. A third key difference is speed. Wakeboarding typically involves towing the rider at 20 to 30 mph for comfortable riding, depending on boat type (speedometers actually vary from boat to boat), rider skills, rope length etc. Though kitesurfers may commonly match such speeds on very flat water and in sustained wind conditions, in average conditions most kitesurfers ride comfortably in the 15-20 mph speed range. The biggest difference, though, is that in wakeboarding, speed is pretty much constant from the boat. and the rider has no control over it. In kitesurfing, speed varies a lot with variations in the wind, water surface, and rider-controlled kite power. Another aspect that distinguished wakeboarding from kitesurfing is in optimal riding conditions which are basically opposite. While you need significant wind (generally 10+ knots) for kitesurfing, the best conditions for wakeboarding involve perfectly smooth and glassy water – which requires no wind or waves at all. A final key difference I’ll mention is riding stance and board position. Riding wake is closer to a 50-50 weight distribution between legs on the board than kitesurfing stance – unless of course, you’re doing wakestyle kiteboarding. Also, in wakeboarding it’s easy to ride on the flat of your board when just following behind the boat as you’re being pulled horizontally at a constant speed, and the strong rocker of your board lets you ride flat (see next section). You’ll typically edge when riding on the side of the boat or when doing tricks. Conversely, in kiteboarding you almost always need to edge and ride on the rail to maintain tension in your lines and thus power in your kite – riding flat for more than a short while, including when riding downwind, is likely to lead to slack lines and kite stalling or outright dropping out of the sky. The main reason many people tend to compare wakeboarding to kiteboarding, besides the fact that both are traction board sports, is the similarities between the boards, both rectangular and symmetrical shaped with similar sizes. While wakeboads and kiteboards do look alike, there are some fundamental differences between them. Wakeboards have far more rocker than kiteboards (typically 3″ vs 1″ for kiteboards) since they are meant to go faster with a more constant pull, with no rider control over speed. Rocker reduces water friction and hence the likelihood of the board being caught and wiping out. More rocker also makes riding on flat easier and safer. Due to the rocker, wakeboards have lots of grove and drag. Kiteboards, on the other hand, aim to maximize planing (floating) with lower pull power instead of focusing on speed, so they tend to offer less rocker for a larger contact surface with water. In comparison, a wakeboard only has 1/3 to 1/2 of the board in contact. Though wakeboards and kiteboards are typically built using the same materials and technology, kiteboards are made to be much lighter (4-6 lb vs 7-8) and flexier than wakeboards. The reason is that flex allows a kiteboard to absorb chop better and have better efficiency given the lower pull from a kite when compared to boat pull. A flexier board also allows the rider to make tighter turns e.g. when changing direction. Wakeboards, on the other hand, are much stiffer as they are designed to ride in very flat water and at higher speeds. Wakeboards don’t need to make as tight turns since the rider can never turn in the opposite direction. Wakestyle kiteboards are closer in flex to wakeboards to allow for harder landings, more pop, and more direct response in the air. Wakeboards come with fullboot, snowboard-like bindings, whereas kiteboards typically have foot strap systems – again except for wakestyle kiteboards. The reason is that kitesurfers need to be able to take their feet out of the bindings quickly due to the unpredictable nature of the kitesurfing environment – wind gusts and lulls, waves, obstacles etc. It’s also much easier to get into waterstart position with your feet not attached to the board. Kiteboarders also constantly need to edge and often adjust their fete position within the footstraps. Wakeboards have fins much smaller than kiteboards, again because of the lesser focus on rail edging and the typically higher speed. Wakeboarders tend to completely remove the fins to practice obstacle tricks (e.g. kickers and sliders) whereas kiteboarders use fins even for freestyle tricks. Does wakeboarding help with learning to kitesurf? In short, the answer is yes. Wakeboarding lets you focus on board riding skills without worrying about where the kite is. Once you know how to ride a wakeboard, the only thing left to learn is how to fly and control a kite. Wakeboarders tend to pick up kitesurfing much faster than others – sometimes by a few days! Learning the waterstart is similar in wakeboarding and kitesurfing, so it’s a skill than can carry over from wakeboarding to kiting. In my experience, however, being a seasoned kitesurfer did not help a lot with mastering the wakeboard waterstart, as the horizontal direction and the significant pull in the arms are quite different from the kiting feeling. Some kitesurfers turn to wakeboarding for cross-training when there’s no wind. Wakeboarding lets them practice board skills such as popping and edging, switching stance, jumping etc, that directly apply to kiteboarding. The best way to wakeboard for kitesurfing training is to go ride at a cable park, which gives you an experience comparable to a kite session constant and unlimited wind. Go with your kiteboard and normal kite footstraps, and have the cable (or boat) tow you at relatively slow speed. Consciously focus on edging (vs flat riding) by going around the cable corners so as to help build your kiting skills. Wakeboarding requires a significant amount of arm and upper body strength to hold the handle during a session. In contrast, in kitesurfing, the pull mostly goes through the harness and hence the core muscles (abs, lumbar, hips, upper legs). As a result, you get much less arm exhaustion with kiting and can have much longer sessions. Kiteboarders who go wakeboarding at first often get exhausted after about 15 minutes due to the strong upper body workout from hanging on to the tow rope, and from constantly transferring the pull from the arms to the lower back and legs down to the board. Improving riding stance, body position, and handle grip, however, will reduce lower body strain. Nevertheless, most kiteboarders agree that wakeboarding is harder on the body than kitesurfing. Most kiters can ride for 2 to 4 hours on end without problems but need to take a break after 15-20 minutes of wakeboarding due to upper body exhaustion. Overall, wakeboarding is harder and less forgiving than normal kitesurfing. Wakeboarding sessions can probably be compared to a 30-minute kite session in which you’re unhooked and constantly riding upwind! Wakeboarding is more costly than kitesurfing due to the need for a boat. Buying a ski boat typically require an investment of $50K+. Also, you need to factor in maintenance and operating costs including fuel. Of course, depending on where you are and how often you ride, you can opt for renting a boat (e.g. from $70/hour). Going to a cable park is a cheaper alternative, some offering 2-hour passes around $35 and all-day passes around $55. Kitesurfing equipment, on the other hand, may start around $1500 for new gear including a single kite – covering only a given wind range, control bar, board, harness, and pump. 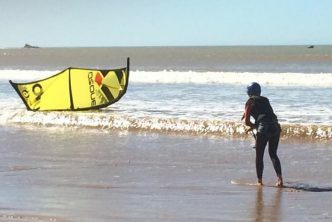 Unlike for wakeboarding, there are no additional costs for actually going riding (no boat fuel/maintenance/insurance or rental or cable park passes), making kitesurfing a cheaper option. See my full post on the cost of kitesurfing. 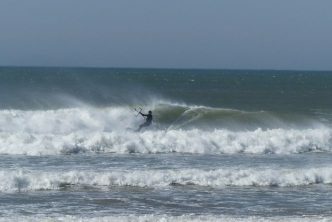 Another important aspect to mention when comparing wakeboarding and kitesurfing is riding opportunities. You may or may not have access to a ski boat and/or cable park near where you live, and you may or may not have time to get the boat ready for each session. On the other hand, whether you can easily go kitesurfing depends on how far the nearest spot is and how many days of good wind you get per year. In general, people are more likely to live close to a windy lake or beach for kitesurfing than have a boat or cable park available nearby. For all these reasons, it seems to me kitesurfing wins the race! Kitesurfing vs surfing: which is better?